I know that I’ve gone on and on about it in the past, but BY GOD does Sony need to do something about its marketing team. Although many of their films have been complete and utter duds over the last few years, and were advertised as such, the few ones that have actually been pretty decent have been saddled with trailers that do not do the finished product any justice. The Peter Rabbit trailers looked horrendous, but the movie itself was actually tolerable; same with Baby Driver, Jumanji: Welcome to the Jungle, both Jump Street movies, and even the 2016 Ghostbusters reboot was a lot better than the trailers suggested they’d be (and in the cases of some online cry-babies who just won’t let bygones be bygones, still is). If it weren’t for those movies’ word-of-mouth, those trailers would have spelt an early grave at the box office for all of them. The exact same fate now meets Alpha, a movie that has had its release date switched an alarming amount of times over the past year, originally scheduled for September last year before moving to March of this year before then being bumped all the way to September this year to finally settling on a mid-August release, yet none of that stopped the studio from releasing the first trailer for it well over a year ago now. That trailer was around for so long even after it moved from release date to release date, that people started getting confused over whether it was actually going to be released or not, yet the studio remained mum about its status other than that trailer – until shortly before its final release, when it debuted a new trailer that made the movie look even worse. Cheesy voiceover narration that was apparently loaned from 90s trailers painted the story as a family-friendly yarn, even throwing in sappy pop music that was most certainly not around when this film was set; it became very clear that Sony, as usual, had no idea how to market this thing, leading to almost everyone not looking forward to what was surely going to be yet another misfire for the studio. Or at least it would be, if it weren’t for the fact that this movie actually isn’t as bad as it was made to look. Once again, Sony’s marketing department has screwed this film royal, because box-office intake is not that great despite critics giving it a surprisingly strong 82% on Rotten Tomatoes, which leads me to assume that so many people were put off by the horrible trailers that they just decided not to bother. It’s a shame, because while Alpha isn’t going to be the next big masterpiece, it’s a pretty decent flick that’s simple and straightforward, while looking absolutely fabulous in the process. Set somewhere in Europe over 20,000 years ago, we follow young tribesman Keda (Kodi Smit-McPhee) who accompanies his father, the tribe’s chief Tau (Jóhannes Haukur Jóhannesson), on a hunt before the winter comes. During a bison chase, Keda is knocked off a cliff and separated from his group and father, who all assume the young man to be dead; not so, of course, as Keda must now wonder through the wilderness alone if he is to return home – except he won’t be alone, as he soon encounters a wild wolf that he nurses back to health after wounding it, and the two become friends as they survive this unforgiving landscape together. It’s a very basic plot, one that you’ve certainly seen before in other movies, but it’s executed extremely well by the direction and especially the cinematography that you honestly don’t mind because it’s all so stylish (and in fact, it does this sort of plot better than a lot of other movies like this). Director Albert Hughes, one-half of the Hughes Brothers who previously gave us films like Menace II Society, From Hell and The Book of Eli, has shown with those films and other projects to be a very stylish and competent director, and here he really proves to be a strong solo force that adds a unique sense of style and wonder to scenes, from how he uses fast-motion to signify the passing of time to even having the blatant CGI blend well into the background despite its obviousness. He also gets a very strong performance by Kodi Smit-McPhee, who immediately gives you a sense of his character without much in terms of dialogue (side note: there’s not a word of English spoken in the entire movie, with all dialogue done in a fictional dialect, another thing that really sets itself apart from other prehistoric movies that just have their characters speak perfect English), and in many of the scenes where he’s only interacting with the wolf – who is adorable, by the way – he really sells the emotion to a point where you really do feel for this kid and want him to make it home to his tribe. The real star of the movie, however, is by far and away cinematographer Martin Gschlacht, whose breathtaking imagery make for some of the most beautiful shots you will likely see in a film all year. Never before has an intense and even scary prehistoric period looked so gorgeous, as it does a lot of wonderful things with sunsets, snowstorms, skies at night-time, and even just sitting around a fire in a cave. Be sure to see this movie on an IMAX screen as the beauty of this cinematography really needs to be seen on the biggest screen possible, but if the movie does somehow prove to stick around in people’s memories by the end of the year, don’t be surprised to see this cinematographer pop up on one or two awards shortlists (though it’s unlikely, but they nominated the cinematography from Batman Forever that one year, so anything’s possible). That is, if people do actually bother to go see the movie, unless those awful trailers really did put them off it for good, not to mention the fact that it’s been moved around so much by the studio. I certainly hope that it does stick around for longer than people think, because it’s a perfectly good movie with some strong acting, stylish direction, and especially some absolutely stunning cinematography that did not deserves to be treated this way by Sony’s utterly useless marketing team. Once again, I must say this: Goddammit, Sony! 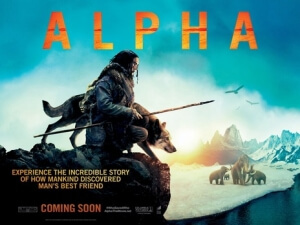 Alpha is a strong and stylish survival movie that’s bolstered by strong acting, unique direction, and some of the most beautiful cinematography you’ll see in a film all year, and deserves more than the terrible trailers put out for it.